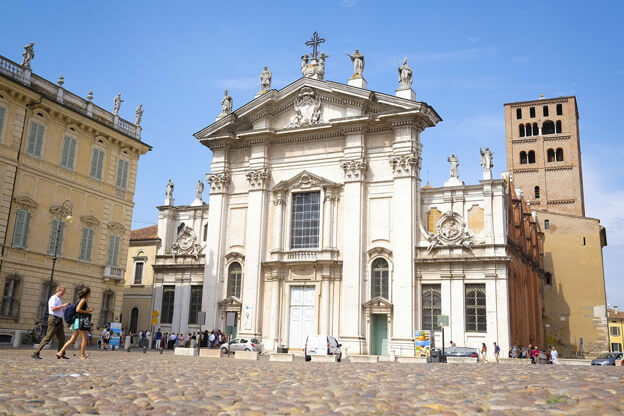 In our series featuring famous Italian families, we look at the powerful dynasty of the Gonzaga, rulers of the Lombard city of Mantua for four centuries. The House of Gonzaga was a princely family who held a prominent role in the history of Italy and Europe from the 14th to the 18th century. They ruled Mantua in northern Italy from 1328 to 1707; they also ruled Monferrat in Piedmont and several other territories in northern Italy and France. Through skillful ambassadors and shrewd political marriages, the Gonzaga were able to form alliances with the most powerful families of their time and to maintain a leading role in the politics of Italy and Europe for four centuries. Their family includes a saint, 10 cardinals, 12 bishops, a queen and two empresses of the Holy Roman Empire. The Gonzaga were also great patrons of the art; like the Medici of Florence, they used their wealth to embellish Mantua and to promote the city’s artistic and cultural life at the highest level. The art collection of the Gonzaga, known as the "Celeste Galeria", was famous throughout Europe, and included works by the most renowned artists of the Renaissance and Baroque age (most of the collection was sold to King Charles I of England when the dynasty began experiencing economic difficulties, after decades of battles and excesses). In addition to the visual arts, the Gonzaga also supported many great literary and musical works. A skillful combatant, open-minded, and extremely rich, Ludovico I Gonzaga (1268 - 1360) is the founder of the Gonzaga family. Born in Mantua, he ousted Rinaldo Bonacolsi in 1328, replacing him as capitano generale and becoming the first capitano del popolo of Mantua; he was later appointed imperial vicar. In 1349, Ludovico hosted poet Francesco Petrarca, who was in town to visit Virgil's tomb. Francesco I Gonzaga (1366 – 1407) ruled Mantua from 1382 to 1407. During that time, he led a policy of balance between the nearby powers of Venice and the Visconti of Milan. He is remembered as the builder of the Castle of San Giorgio, the nucleus of the Ducal Palace of Mantua, the Gothic façade of the city cathedral, and the bell tower of the Basilica of Sant'Andrea. Gianfrancesco I Gonzaga (1395 – 1444), the son of Francesco I, was the first Gonzaga to bear the title of marquess, which he obtained from Emperor Sigismund in 1433. During his reign, the dominion of the city over the surrounding territories expanded, while numerous artists and intellectuals, such as famous humanist Vittorino da Feltre and painter Pisanello, were invited to Mantua, starting the role of the city as a capital of the Italian Renaissance. Gianfrancesco I founded the first workshop in Italy for the manufacture of tapestries. Ludovico III Gonzaga of Mantua (1412 – 1478) was the ruler of Mantua from 1444 until his death in 1478. His education was entrusted to the humanist Vittorino da Feltre. This most likely explains Ludovico III’s concern for humanistic culture and the growth in public works throughout the city, from the paving of the streets and building of a clock tower to the reorganization of the city center. Among the famous humanists invited to the city was the Florentine Leon Battista Alberti, who designed the San Sebastiano and the Sant'Andrea churches. In 1460, Ludovico appointed Andrea Mantegna as court artist to the Gonzaga family; he would serve at the court of the Gonzaga for three generations. Ludovico III is the commissioner of the famous Camera degli Sposi in Mantua’s Ducal Palace. Federico II Gonzaga (1500 – 1540) was ruler of Mantua, first as Marquis, later as Duke from 1519 until his death in 1540. He is the commissioner of Palazzo Te, his summer palace just outside Mantua designed and decorated by Giulio Romano. He was also celebrated by Ludovico Ariosto in his masterwork Orlando Furioso. While not an ‘original’ Gonzaga, Isabella d'Este (1474 - 1539) married into the family and is worth mentioning because she was one of the most influential women of the Renaissance and of the Italian cultural world of her time. She married Francesco II Gonzaga in 1490 at age 15, became Marquess of Mantua and served as the regent of the city during the absence of her husband. Isabella was born in the city-state of Ferrara, grew up in a cultured family and received an excellent education. She was a patron of the arts and a leader in fashion; her innovative style of dressing is said to have inspired women throughout Italy and at the French court. The poet Ariosto described her as “bella, gentil, cortese e saggia” (beautiful, kind, gracious and wise). Mantua is usually overlooked by visitors in favor of Verona and Venice, who miss out on its centro storico (old town), declared by UNESCO a World Heritage Site. 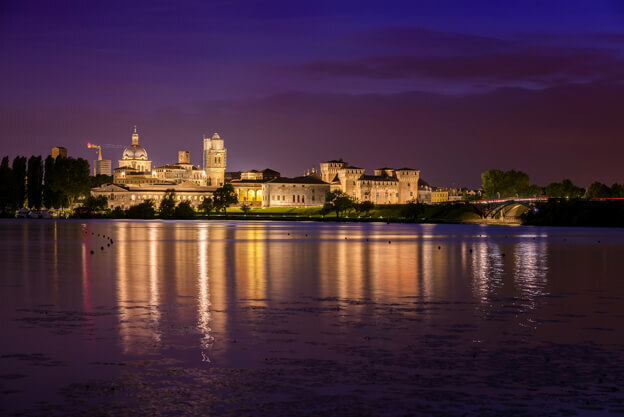 The Gonzaga ruling made Mantua one of the main artistic, cultural, and musical hubs of Northern Italy and Europe. This is evident in the city’s architectural treasures, works of art, elegant palaces, as well as the medieval and Renaissance cityscape. 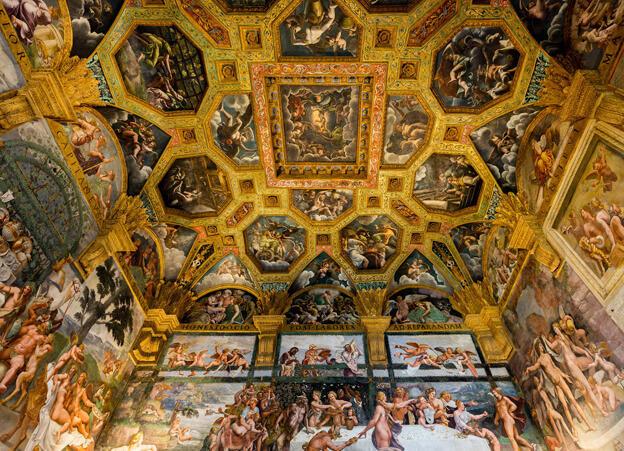 A masterpiece of Italian Renaissance art, the Bridal Chamber – Camera degli Sposi – inside Mantua’s Ducal Palace was frescoed by Andrea Mantegna between 1465 and 1474 and is especially famous for the use of trompe l'oeil details and its di sotto in sù ceiling, evident in the “oculus”, a fake opening toward the sky showing cherubs (“putti”) peering down into the room. Some of the frescoes depict the family and court of Ludovico Gonzaga, while other frescoes are said to refer to the election of Ludovico's son Francesco Gonzaga as Cardinal. They are all meant to celebrate the Gonzaga dynasty. The royal residence of the Gonzaga family, the Ducal Palace, is one of Europe’s largest monumental buildings, measuring about 34,000 square meters, with some 500 rooms. Its construction began in the 13th century by the Captain of the People Guido Buonacolsi, whose family ruled the city before the Gonzaga. Additional buildings, connected by corridors and galleries and enriched by inner courts and gardens, were added through the centuries, resulting in a mix of architectural styles. The Gonzaga family lived in the palace from 1328 to 1707, when the dynasty died out. 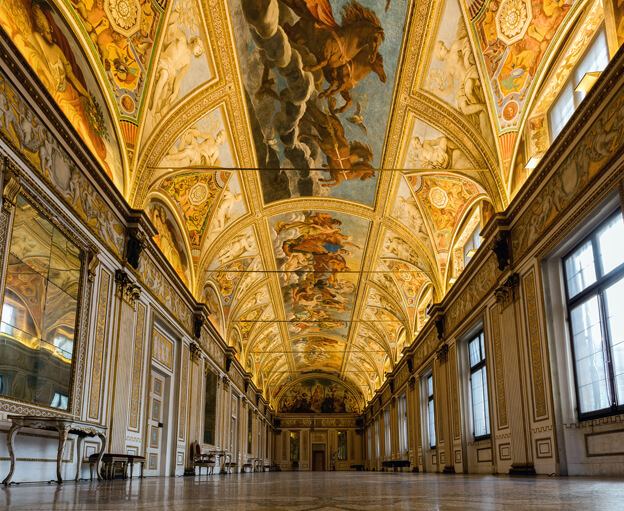 The palace includes some 500 rooms, including the Apartment of Isabella d’Este and the Apartment of the Tapestries, the courtyards and gardens and the Palatine Church of Santa Barbara. Want to know more about Mantua? Here are 10 things not to miss. Familiarize with Mantua's food traditions with our Foodie Guide.